What is Kitchen Parade all about? How to print a recipe? 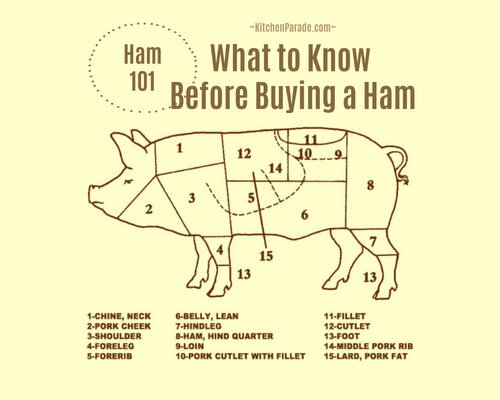 Looking for a recipe you saw in print? Is it okay to leave a comment? How do you calculate the nutrition estimates? What does it mean to "Alanna-size" a recipe? Would you like to publish a photograph? What is Kitchen Parade all about? Kitchen Parade is the food and recipe column written by Alanna Kellogg, a second-generation food writer and a home cook in a home kitchen in suburban St. Louis. 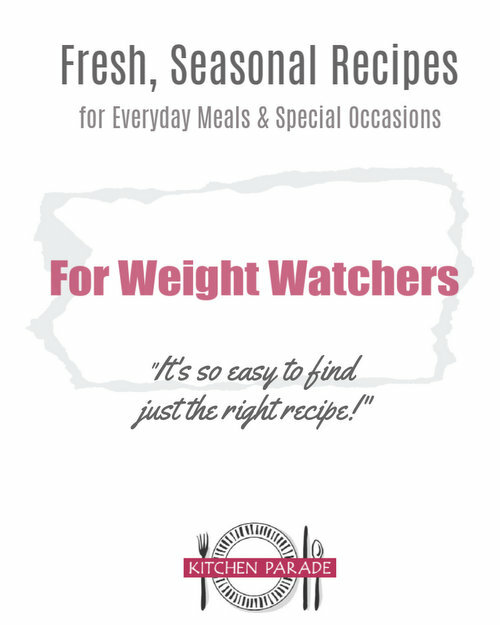 It features fresh seasonal recipes for everyday healthful eating and occasional indulgences. Read more about Kitchen Parade, its history, its author, its inspiration. How to print a recipe Most recipes print on one page, and in side-by-side columns just as they appear online, this makes them easy to shop from, easy to cook from. To print a recipe, click "print" on your browser bar – or click "print preview" to decide whether to print the first page only. Some longer recipes do fall onto two pages. Otherwise, copy what you want to print with a Copy/Paste function into your word processing application, then print from there. Looking for a recipe you saw in print? Beginning in 2005, all columns are online and can be most easily found via Recipes by Year. While most 2002 - 2004 columns are online, some aren't. Naturally I’m happy to forward what your'e looking for, just drop me an email via recipes@kitchen-parade.com. How to find a specific recipe In the search box at the top of each page, enter a keyword of the recipe name. If you remember approximately when the recipe was published, check Recipes by Year. If you remember a main ingredient, check Recipes by Ingredient. If you still can't find it, let me know via recipes@kitchen-parade.com. I'm happy to help! How to share a recipe Share your family’s favorite recipe! Write to recipes@kitchen-parade.com. How to learn about new recipes New recipes post several times a month. But to never miss a single recipe, Kitchen Parade is also available via a free e-mail subscription (here's how to subscribe) and the free RSS feed (here's the feed) and on Twitter and on Facebook. Is it okay to leave a comment? Yes! I love to hear from readers! And everyone is welcome to comment, you needn't be a food blogger. Your comments often make my day – I thank you! If you're intrigued by a column or it triggers a memory or if you make a similar dish: please tell. If you don't understand a technique, wonder about a substitution, question a quantity: please ask. If you tried a recipe and loved it, or tried a recipe and applied a personal touch: please share! To comment, click "post a comment" at the bottom of any recipe, then write your comment in the comment box. To "sign" your comment, leave your name – or a nickname or if you like something like "Karen from Minnesota" or just click "anonymous". No one, including me, will know more information than you leave, including your e-mail address. You may press "preview" to look over your message, otherwise just press "publish". You'll be asked to type some odd-looking letters in order to publish; this is a pain but prevents an onslaught of automated spam comments. How do you calculate the nutrition estimates? From 2002-2008, I used recipe management software for Windows called Accuchef for nutrition analysis. The software has many other features but nutrition analysis is what makes/keeps me a power user. I've tried others but always come back to it. You can enter your own recipes but it's especially convenient to import recipes from other sources (click File / Import Wizard). A trial copy allows 60 uses, then it's only $20. I've had a couple of technical issues, both were answered promptly/helpfully by the developer/owner himself. Beginning in 2008, I switched to a Mac and converted to MacGourmet, including its nutrition calculator. What does it mean to "Alanna-size" a recipe? Regular readers know how committed I am to helping people make informed food choices. That's why every recipe includes nutrition information and Weight Watchers points. But it goes further than that. To me, every-day food is the stuff we can eat in reasonable quantities every single day and indulgences are special treats for every once in awhile. Even before I started to write Kitchen Parade in 2002, I was removing unnecessary fat and sugar from recipes and creating "real-life" portion sizes. My St. Louis friends started to call these smaller, lower-fat and less-sweet recipes "Alanna-sized" and the term stuck. Perfecting the basic technique, I've learned to add or increase low- or no-calorie ingredients and flavors to recipes where I've removed fat and sugar. My goal is to make food "satisfying" – just enough but not too much. What about the photographs? My camera and photo equipment is as fancy as my kitchen! Mostly, I try to make the food look real – and with any luck, to send other home cooks straight into the kitchen, recipe in hand. I take all the photographs myself. Until 2008, I used a small 5.1mpx point-and-shoot camera that was so small, it got tucked into my purse and pocket ALL the time. I called it the "baby Nikon" but Nikon prefers the name Nikon Coolpix S1. The S1 model is no longer available but I still like the current Coolpix cameras . In 2008, I converted to a Canon Digital Rebel , although sorry, again, the specific model is no longer available. Many food bloggers love-love their Rebels but Canon and I just didn't think alike. Maybe because before digital, I had a Nikon SLR? So in 2010, I switched back to Nikon with a Nikon D90 with a 35mm lens , the first digital camera gear that "thinks like me". Then in 2015, I upgraded again, again with Nikon, this time to the wonderful Nikon D7100 . I also often rely on a compact, lightweight tripod and a "bounce flash". Food photography is a continuing challenge but I am happy to be seeing steady improvements, the longer I practice the craft. Until 2013, the outdoor shots were taken in my back yard in Kirkwood, Missouri (a St. Louis suburb) that proved decidedly photogenic: a brick patio with a vine-topped wall, a split-rail fence, beautiful trees (tree people will recognize a mature cherry, a slowly maturing dogwood, mature oaks and sweet gums in the background and a huge weeping fir) and my flower gardens, mostly perennials. Other shots are taken at the kitchen table, a few in the dining room, and during the winter when natural light was scarce, I used a "bounce flash". Beginning in 2008 and then exclusively in 2013 when I moved to live with The Man With the Hands, most shots are taken in our home here in suburban St. Louis. The dishes are usually odd pieces picked up for a dollar or two, ones that let the food be the focus. Would you like to publish a photograph from Kitchen Parade? All content on Kitchen Parade is the original creation and property of Kitchen Parade (unless otherwise noted). (i) Credit the photo to Kitchen Parade directly below the photo with this text "photo provided courtesy of Kitchen Parade" (or something similar, your choice). (ii) Link the photo and the text "Kitchen Parade" back to http://www.kitchenparade.com/. (iii) Do not "hot link" the photo, load it onto your own site. (iv) Do not use a photo for commercial purposes. (v) Do not alter, transform, or build upon a photo. These terms apply only to publishing photographs online. For information about the use of photographs in print or any other medium, please contact Kitchen Parade at recipes@kitchen-parade.com. ADVERTISING Advertising contributes to Kitchen Parade's grocery budget and operating expenses. If you represent a cookbook or product, this is the fastest way to directly reach the readers of both Kitchen Parade and my food blog A Veggie Venture with placement options available through BlogHer and Google. Please contact me via recipes@kitchen-parade.com for more information. PRODUCT REVIEWS Occasionally publishers and product companies offer to send complimentary copies and samples. I am happy to accept! and at the same time, offer these thoughts. For KITCHEN PARADE: I occasionally mention cookbooks, products and ingredients that fit Kitchen Parade's mission of "fresh, seasonal recipes for everyday healthful living and occasional indulgences"; that I especially like; that I have learned to rely on over time; and that are readily available to Kitchen Parade's readers. Here are examples, a generic product mention and specific product mention. If you represent a cookbook or product that fits, please send me an e-mail via recipes@kitchen-parade.com for more information. For A VEGGIE VENTURE: I never write product or cookbook reviews, per se, for A Veggie Venture, my food blog about vegetables. But since it's published online with a broad readership and is my food playground, I do create more latitude to mention books and products that are on topic (that is, somehow connected to vegetables) when they're ones I feel called to cook from and like and think my readers might, too. Here are examples, a cookbook example and a product example; please note that both had "take-away lessons" that made them worth mentioning, beyond the products themselves. If you represent a cookbook or product that fits, please send an e-mail via recipes@kitchen-parade.com for more information. COMPLIMENTARY PRODUCTS Like many food bloggers, I occasionally accept complimentary cookbooks from publishers and food products from food manufacturers. Naturally, these companies send me stuff hoping that I will write about them in a positive light. Here is my promise: when I do accept a product, I will (1) only mention a cookbook or a product that I actually use and really like myself and (2) disclose that it was given to me. AMAZON AFFILIATE COMMISSIONS When I link to a cookbook, food product or anything else that's available for sale on Amazon, if you purchase it (or anything else after clicking through to it), I may earn a small commission. Amazon requires the following disclosure: "We are a participant in the Amazon Services LLC Associates Program, an affiliate advertising program designed to provide a means for us to earn fees by linking to Amazon.com and affiliated sites." Kitchen Parade and A Veggie Venture use third-party advertising companies to display advertisements during your visits. These companies may use information (NOT including your name, address, email address, or telephone number) about your visits to this and other websites in order to provide advertisements about goods and services of particular interest to you. Google uses the DoubleClick DART cookie which enables Google and its partners to serve ads to you based on your visit to Kitchen Parade, A Veggie Venture and/or other sites on the Internet. Have I missed something? Leave a comment or contact me via recipes@kitchen-parade.com. Thank you. Three years ago I achieved my goal with Weight Watchers. I maintained it for about a year. Now I am about 10 pounds over goal and have decided to go back to WW this week. YOU have inspired me. Da$&@;mn technology. If you would like to email me at blog At kitchen hyphen parade dot com, I'll fix you up. So sorry for extra effort.